1592C.1114 Charles Justus 9 BIGELOW, son of Thomas Ebenezer 8 ( Justus 7 , Ebenezer 6 , Amasa 5 , Isaac 4, Isaac 3, Samuel 2, John1) and Lois (KNOWLTON) BIGELOW, was born 02 March 1877. He married 21 January 1901 Sadie Jerusha Lyons. 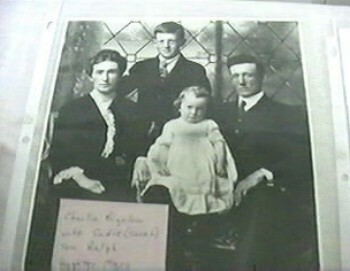 Charles died 12 December 1941, buried Kingsport,, NS. They had three children. 1592C.11141t Ralph M., b ___ 1904; d 10 July 1984; m Priscilla Newcombe (b 29 Sept 1911; d ____ ) 3 children: including Irene Sheila (see below). Kings Co. Hist. Soc. 2/22/1997, Lorna Evans; Addenda 1996, Bigelow Society. Irene was a member of our 2002 Reunion Planning Committee and will be sadly missed. Cancer Society. Funeral arrangements have been entrusted to W.C.
Hiltz/White Family Funeral Home, Kentville.